As profound as Martin Luther's ideas are, this giant of church history was concerned above all with practical instruction for daily Christian living. Harvesting Martin Luther's Reflections highlights this concern of Luther, mining his thought in key areas of doctrine, ethics, and church practice. Gathering noteworthy contributions by well-known Luther scholars from Europe and the Americas, this book ranges broadly over theological questions about baptism and righteousness, ethical issues like poverty and greed, and pastoral concerns like worship and spirituality. There are even rare discussions of Luther's perspective on marriage and on Islam. As a result, Harvesting Martin Luther's Reflections is both a state-of-the-art discussion of Lutheran themes and an excellent introduction for newcomers to Luther's work. 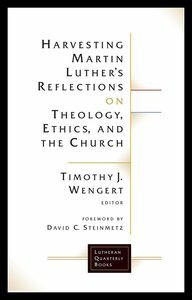 About "Harvesting Martin Luther's Reflections on Theology, Ethics, and the Church (Lutheran Quarterly Books Series)"
Timothy J. Wengert is Ministerium of Pennsylvania Professor of Church History at The Lutheran Theological Seminary at Philadelphia. He is also coeditor of the 2000 English edition of The Book of Concord.